The walkers can fit through a standard doorway and are not designed to stop at the edge of a step. 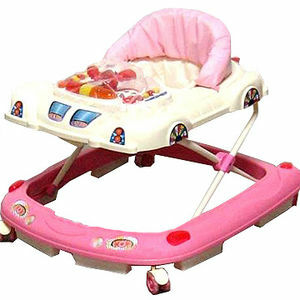 Babies using these walkers can be seriously injured or killed. This recall involves about 200 walkers intended for babies 6 months and older. The item number L-0809EN is printed on the side of the box. The walkers are blue or pink with a white tray. Small independent retailers and discount stores in California and Arizona from June 2009 through August 2009 for between $25 and $28. Stop using these walkers immediately and return them to the store where purchased for a full refund. For more information, contact Le Hing Inc. collect at (626) 575-8566 between 10 a.m. and 4 p.m. PT Monday through Friday.